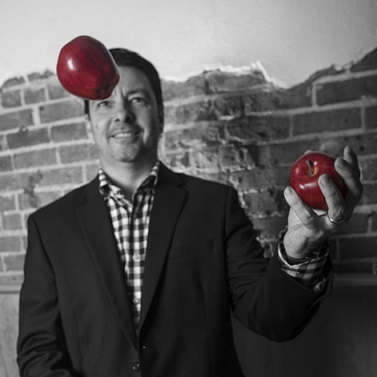 Marc Robertz-Schwartz, founder of Red Apples Media, entered the world of entrepreneurship out of necessity rather than choice, but that has not tempered his success in any way. "People always tell me that it was courageous to launch a business, but it wasn't courage. It was out of fear and desperation," he said. "I got laid off. I was the head of the marketing department for The Villages in '08 when the bottom fell out of the real estate market. We had more than quadrupled their lead bank and they didn't need to do more marketing so they laid off more than half the marketing department from the top down. No one was relocating six figure marketing executives so I had to figure out what to do real fast." Fast forward to 2017, now Robertz-Schwartz heads an award-winning marketing and media company that was just named to the Gator 100 for the second consecutive year as one of the 100 fastest-growing Gator-led companies in the world. "We are Central Florida's most honored and award-winning video production and marketing companies," he explained. "Our core competencies are creating video and digital content and delivering that content across multiple platforms. With that, we also do a tremendous amount of design, print collateral, and traditional media like print, radio, outdoor media and PR outreach." Robertz-Schwartz's advice for aspiring entrepreneurs is to commit 100 percent to your venture. "To be successful, you have to be all-in," he said. "When I was first laid off, I spent half my day launching my startup and half looking for another job. It wasn't until I went all in that my startup started becoming successful."